I settled on Maipo Valley because a) I’d already been to Casablanca Valley and b) I heard fantastic things about the wines available in the region. To be honest, I’m more of a red wine lover myself, so I decided I wanted to see what the Maipo hype-o? was all about. But actually, I’m no stranger to Chilean wine — in fact, I’ve now been wine tasting in Maipo Valley twice. The first time I visited Maipo Valley was actually in 2013, on a tour to Concha y Toro vineyards, and it was the verrrryyyy first wine tasting that I’d ever tried. At that time, I thought all wine tasted the same and I was just there to do the “Chilean thing” of drinking wine in a beautiful place. The tour consisted of a big bus full of (mostly) older tourists and I ended up leaving with 4 bottles of wine (more than I could fit in my suitcase…score!). So, needless to say, when I returned to Chile and wanted to try to see even more of Maipo Valley, I looked for an option that would bring me to a wide variety of wineries in the region. While there were several 1- or 2-winery group tours to Maipo Valley, they seemed really expensive for what they offered. 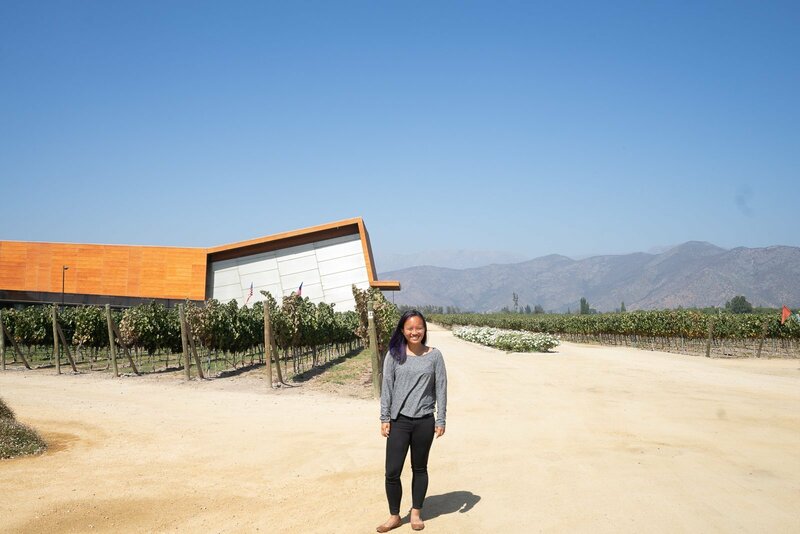 When I stumbled upon Maipo Valley Wine Tours, which offered a “Little Wine Bus” that promises to “visit wineries with a beautiful story to tell, taste excellent wines, enjoy good food and have lots of fun in a breathtaking landscape of vineyards at the foot of the Andes,” I was sold. Food, wine, and fun? Sounds like my kind of day tour! The Little Wine Bus is basically a small group tour of several of Maipo Valley’s wineries and wine areas, and includes both breakfast and lunch. What drew me to this specific tour was how the entire day revolved around wine — from the time you board the bus until the time you get dropped off. And that’s exactly what I was looking for. But let me start by setting some expectations: the Little Wine Bus is NOT a traditional winery/wine tasting tour. You’re not going to sit down, eat oyster crackers, and sample 3-5 wines per vineyard. 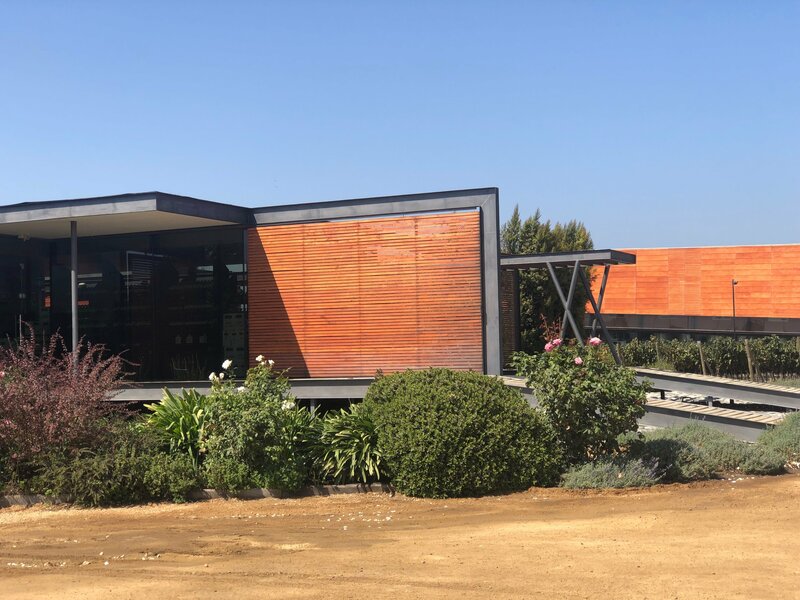 If you are looking for this more traditional wine tasting experience, check out some of Maipo Valley Wine Tours’ other offerings or scroll down to read about some other options. However, if you’re looking for a tour around Maipo Valley where you’ll literally never have an empty glass, this is a fantastic and cost-effective option for getting around (and make some new friends along the way!). 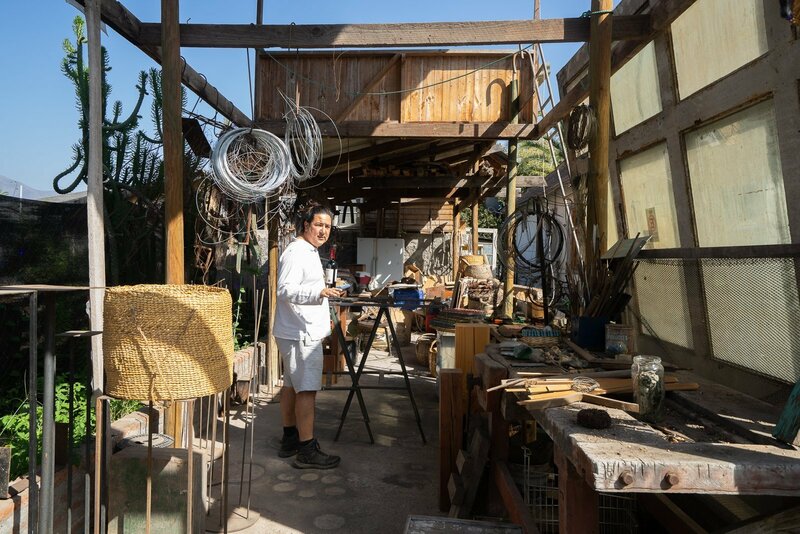 After being picked up at my hotel, the day started in a beautiful little garden next to an art gallery and workshop, where we were treated to coffee, scrambled eggs, toast, jam, and fresh fruits and tomatoes. There were strangely more Americans on this tour than I’d seen in my entire time in Chile (over 6 weeks). Then, around 10 or 10:30 AM…our cheerful guide, Felipe, opened the first bottle of wine, marking the start of our wine infused day of goodness. For the rest of the day, our bus took us around to 5 different stops: 3 wineries, a scenic lunch spot, and a warehouse behind our guide’s house where he served us different kinds of local liquors and drinks. It was totally not what I was expecting to be doing on my tour, but it was also really, really fun. If it weren’t for some straight-up racist people on my tour (in which I was the only non-white target — but we’ll get into this on another, much more heated post), it would have been a really amazingly awesome day. All in all, I’d recommend the Little Wine Bus to anyone looking for a fun experience outside of the traditional wine tastings and vineyard tours that are offered around Maipo Valley. For the price ($97 USD per person), it includes a LOT of wine, visits to 6 different stops, plus breakfast and lunch. If you’re looking for a more traditional wine tasting experience, you can try one of Maipo Valley Wine Tours’ other tours, including the Isla de Maipo Premium Wine Tour or the Top 3 Tour. 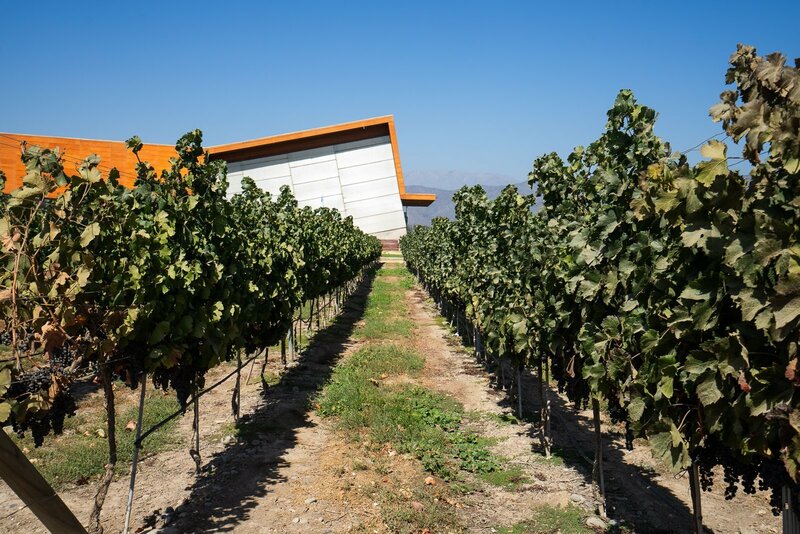 Alternatively, there are several tours available to individual wineries from other tour operators; you can find several awesome and affordable Maipo Valley tour options here. If you’d rather have the full flexibility of choosing when and which vineyards you’d like to stop at, the best way to do this is with your own rental car. Now, before I begin to explain this, I want to throw out there that drinking and driving is horrible and you should ABSOLUTELY have a designated driver if you want to go DIY wine tasting in Maipo Valley. There are several car rental agencies in Santiago that you can choose from. I’ve never rented a car in Santiago, but I usually use Avis for my car rental needs around the world. I’d recommend making a map of all of the wineries you’d like to visit so that you can plan a time and gas-efficient route. If you’re looking for a complete list of wineries in Maipo Valley, you can start here. Maipo Valley Wine Tours graciously hosted my Little Wine Bus tour to Maipo Valley. As always, all opinions, snarky comments, and wine-infused giggles are 100%, proudly, my own.